Therapeutic Laser Services: We offer therapeutic laser treatments for injuries, back pain, inflammatory conditions and arthritis. Our laser includes 2 wavelengths that target both the blood vessels and the nerves. This allows for faster resolution of the inflammation and quicker reduction of pain levels. Surgical Services: Our state-of-the-art surgical suite provides for the performance of a wide variety of surgical procedures. 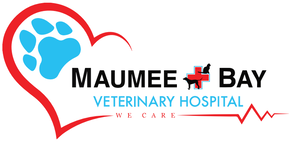 These include sterilization (neuter/spay), orthopedic, and soft tissue surgeries. Anesthesia: We utilize the safest available anesthetics to provide that extra margin of safety, especially for our older or high risk patients. Using advanced monitoring equipment, the patient's vital signs are monitored during all anesthetic procedures. Blood Pressure Screening: We have the ability to measure canine and feline blood pressures along with ECG diagnostic monitoring. This is especially important for our feline patients with hyperthyroidism and cardiac problems. Radiology Services: Our on-site, digital radiograph (X-ray) equipment provides high quality radiographs to aid in the diagnosis of many disorders. We offer diagnostic ultrasound that is used to visualize the internal organ structures without surgery. Both Dr. Kevin and Dr. Heather have advanced training in diagnostic ultrasound. Laboratory: Our in-house laboratory facilities provide for serum chemistry, hematology, serology, urinalysis and dermatologic testing. We also utilize commercial veterinary laboratories for specialized diagnostics and consultations. Pharmacy: We maintain a complete inventory of pharmaceuticals, neutroceuticals, shampoos, heartworm preventatives, and flea/tick preventatives to meet the needs of your pet. Dentistry: Our dental services include teeth cleaning and polishing, full oral exam including dental mapping and probing, digital dental radiographs (x-rays), guided tissue regeneration for tooth salvage, tooth extractions and oral surgery. Individualized Flea and Tick Control Programs: We develop programs for the specific needs of your pet and your own particular environmental situation. Ticks are becoming an increasing issue in our area and so we can help guide you in preventative medications for the safety of your pet and family. Emergency Care: Please call our main telephone number for instructions for after-hour emergency.